Man. Ed. 5, 494. 1867. 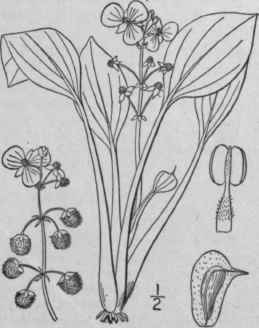 Sagittaria platyphylla J. G. Smith, Ann. Rep. Mo. Bot. Gard. 6: 55. pl. 26. 1894. Monoecious, glabrous, scape erect, simple, rather weak, mostly shorter than the leaves. Leaves rigid, the blades ovate, ovate-lanceolate or ovate-elliptic, short-acuminate or acute at the apex, rounded, gradually narrowed or rarely cordate or hastate at the base, seemingly pinnately veined, 2'-6' long; bracts broadly ovate, acute, connate at the base, 2"-4" long; •flowers 8"-14" broad; fertile pedicels stout, divergent in flower, reflexed in fruit, 1/2' -2 1/2 long; filaments dilated, pubescent, rather longer than the anthers; achene obliquely obovate, winged on both margins, the dorsal margin somewhat crested, the sides with a sharp wing-like ridge. In swamps and shallow water, southern Missouri to Mississippi and Texas. Phyllodia, when present, oblong or oblanceolate. July-Sept.
Alisma subulata L. Sp. PI. 343. 1753. 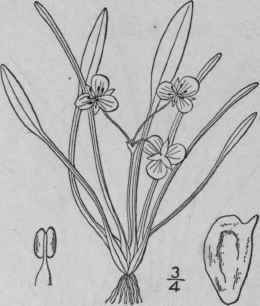 Sagittaria pusilla Nutt. Gen. 2: 213. 1818. .Monoecious or rarely dioecious, scape very slender, 2'-6' high, few-flowered, about equalling the leaves. Leaves all reduced to rigid phyllodia or sometimes bearing linear or linear-lanceolate blades, l'-l 1/2' long; bracts united or partly separated; flowers 5"-8" broad; fertile pedicels reflexed, longer than the bracts in fruit; stamens about 8; filaments about equalling the anthers, dilated, glabrous; achenes less than 1" long, obovate, with narrow wings, 2 or 3 crests on each side, sometimes crenate; beak short. In tide-water mud, New York to Florida and Alabama. July-Sept.
Sagittaria natans lorata Chapm. Fl. S. U. S. 449. 1860. ?Sagittaria natans (?) gracillima S. Wats, in A. Gray, Man. Ed. 6, 556. 1890. ?Sagittaria subulata gracillima J. G. Smith, in Mem. Torrey Club 5: 26. 1894. Sagittaria lorata Small, N. A. Fl. 171: 52. 1909. 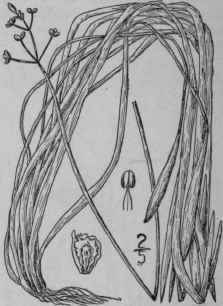 Monoecious, scape elongate, 1/3°-3 1/2° long. Leaves with bladeless petioles or blades when present floating, elliptic, oblong or ovate-oblong, 7 1/2'-25" long, rounded, subcordate or hastate-truncate at the base; phyllodia flattened, straplike; whorls one or several; bracts thin, acuminate; sepals becoming 1 1/2"-2 1/4" long; corolla fully 10" wide; achenes 1"-1 1/2" long, with 5-7 prominently dentate or crenate crests, the beak erect or curved upward. In ponds and streams, New Jersey to Florida. The form S.. natans gracillima (the fruit of which is unknown) in Massachusetts and Connecticut. Butomus umbellatus L., a plant of the related family Butomaceae, with many-ovuled ovaries, rose-colored flowers and narrow ensiform leaves, native of Europe and Asia, has been found on the shores of the St. Lawrence River, near Montreal.